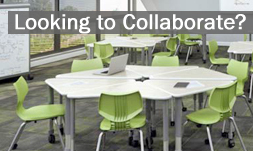 Worthington Direct has all the information technology furniture your school needs to train the future IT work force. Find great deals on Flat Panel Workstations by Paragon or lead the class with the popular Sit-Stand Computer Workstation by Bretford. Visit www.WorthingtonDirect.com today and find the perfect platform on which to grow your technology education program. Looking for support in revising your curriculum to reflect the needs of 21st-century learners? A new online resource could help: On Aug. 2, the Partnership for 21st Century Skills (P21), a national coalition of business and education leaders, issued a revised plan to help students and educators achieve 21st-century learning goals. According to P21, the group’s revised framework “addresses key [concerns] by developing a clear vision for 21st-century student outcomes in the new global economy.” For the first time, the plan also “defines how school systems can best support these outcomes,” P21 says. This latest offering builds on the organization’s previous efforts to guide the integration of so-called “21st-century skills” into the curriculum. It’s essential, say coalition members, that students have a strong grasp of these skills for the United States to remain competitive in the 21st-century economy. To help promote what P21 calls “real-world applications of content,” the coalition has added a new skills category, called “Learning and Innovation Skills,” to its framework. These skills distinguish “those students who can thrive in the complex life and work environments of the 21st century,” and they focus on creativity, critical thinking, communication, and collaboration, as well as mastery of information, media, and technology skills–all of which are “essential for preparing students for the future,” according to Charles Fadel, a P21 board member and global education leader for Cisco Systems Inc. Fadel added: “We live and work in a technology- and media-driven environment, marked by access to an abundance of information, rapid changes in technology tools, and the ability to collaborate and make individual contributions on an unprecedented scale. To be effective in the 21st century, today’s students must be able to exhibit a range of functional and critical-thinking skills related to information, media, and technology.” Other skills stressed in the new framework are what P21 calls “Life and Career Skills,” such as flexibility, accountability, innovation, self-direction, social and cross-cultural skills, leadership, and responsibility.